So much to say, so little time to write it all down. The magic continues to unfold. My second week in Vietnam, and I feel though I have experienced life times of love, friendship, food and adventure. Today I went to the swanky coffee shop on the corner, near my hotel in “foreigner town” . I caught the closest hotel I could find last night, because I had a busy day ahead of me in Ho Chi Minh City. After the dynamic week of clowning with Humanitarian International and Geshundheit!, my dear new American friends and trip leaders Fungus and Skete (long time friends and clown staff of Geshundheit! and dear teachers of the how to maintain the spirit of love) left with five other clowns who visited Vietnam for the one week session of clowning and caring in the City. We had a dynamic and eye opening experience here in Ho Chi Minh. From the anarchy chaos of the motor-bike traffic, monsoon rains at night, kaereoke songs floating across the air on weekends, the occasional lost bus driver on back roads making circles, the unexpected moments when our clowns showed at a hospital expecting to sit by bedsides and to our surprise a DJ was set up and a stage cleared for us so that we marionettes to jazzy disco music for the cheering lobby spectators. When we tried to sneak off “stage” to find hospital beds, we were herded back into the crowd. Here I took the opportunity to encourage near by children to perform acrobatics and break dancing (this took the pressure off of me). In those moments of forced slap stick theater, it was obvious that our mission for bedside clowning had been lost in translation between the organizers and the hospital administration. Or perhaps it was more convenient for the hospital staff to keep us contained in a cage of disco music, where we could be watched and where we would not see the actual hospital conditions. Last friday, the American clown group left for home, and I remained here in Ho Chi Minh City, gudied by my new Vietnamese friends whose care and guidance extended into a motherly spiritual guidance. My first day alone in the city, I cried. My journal entry reads “Day one Melt Down”. I felt sad to loose the group as I packed my bag to prepare for moving into a new hotel. Suddenly I had to make many choices on my own. No set schedule, no bus driver to guide me every day, no group of english speaking americans to tell me what is next. Seemingly, II was being stripped of my hemogeonized padded room in a unfamiliar City of over 8 million people. I questioned what I had set myself up for. For a moment, fear passed through my body. Fear that was coupled with sub-concious emotional burnout from the intensive days of clowning the week before. However, I decided to face this fear. The fear of the unknown. The fear of losing confidence in my “false sense” of security. Participating in social work as a caring clown has taught me so much about this fear, the fear of getting close. This fear not only involves getting close to other people. It is also the fear of closeness to oneself and ones intuition. My first night in the hotel, I took my ukulele down to the lobby to perform for the matriarch family members of “Lili” the friendly hotel manager. They clapped and laughed and in exchange for my songs, gave me lesson in counting in ten in Vietnamese. Lili always sings after 6pm”, said one of the backpackers who’d been at the hotel for two nights. After meeting Lili’s relatives, It was clear that her enthusiam for song and dance was genetic. One of the cultural aspects that I admire the most in Vietnamese Culture is the family unit remains very close and connected. Most commonly, all family members including children and elders remain living together until death or marriage. One day after resting in a hotel in the city, I took a bus to Muine Beach, a small town just outside of Phan Thiet. The actual town where I stay was called “Hampton”. The REAL Muine where most locals lived, was situated about 12 Kilometers down the road from Hampton on a little fishing port. For the sake of tourist attraction, Hampton is reffered to as “Muine”. Aside from a few whose houses are situated in the tourist district, many locals only come to the fake “muine” to work at a restaurant, a resort, a toursit company, or to sell fruits or souvenir. According to a motor-bike driver “Thanh” whom I spoke with during a monsoon rain storm at a book store, locals are often forbidden by resorts to swim on the beaches or sometimes lcoals are forbidden to mingle at the bars with tourists. “They are the people of this place. They live here. This is their home. And they are not allowed”, said Thahn with a compassionate distressed tone in his voice. As the rain poured down and the power cut off, rain filled the streets and quickly formed a lake. The ocean waves crashed heavily, sounding much like dump truck pouring gravel. Thahn and I sat in the dark on small plastic chairs underneath a slightly leaky tin roof. At first I felt concerned that we would be washed away by a huge wave created by the fierce storm. None of the Vietnamese looked concerned, so I contained my nervous reaction and sat down to listen as my new friend Thahn told stories about the life of a local in the Muine area. Thahn explained that many people work long hours every day for very little pay, at resorts whom charge tourists up to 200$ a night for stay, workers can make as little at 50$ dollars per MONTH for a full time job at the same resort. Meanwhile, tourist often leave no tip for waiters because it is “not custom in Vietnam” for tipping. My advice to travelers; Leave a tip and gain some good Karma while have to opportunity, what are you going to with that extra 25 cents anyway? Due to the drastic dollar difference between US$ and Dong, Tourists practically treat Vietnamese Dong like Monopoly game money. 5,000 of Dong is close to 6 cents in US dollars. So, many tourists take home a 100,000 dollar bill for a wall hanging souvenir, mean-while many Vietnamese workers only make 100,000 for 10-12 hours of work. Yet another way that I am blown away by the class differences that stretch across the world. Though I too am somewhat of a tourist, I try my best to distinguish myself from the typical tourist by smiling and waving to locals, making eye contact, at the very least, making an effort to acknowledge their humanity as they persistently attempt to sell me something on the street. This acknowledgement or humanity, is something that I feel many socially privileged people feel little obligation to do. So with this observation, my new practice is to be friendly whenever possible. I can’t promise that I always accomplish this friendly disposition in my moments of neurotic self-indulgence. Sometimes I too turn away from pan handlers on the street, for my own convenience and self “protection”. I have to go now, today I catch a bus to Duc Linh, to work for one week in a small town. If you appreciate what you hear from my blog, please write me at ashdevinebooking@gmail.com, and make a donation through on the first page of my website. 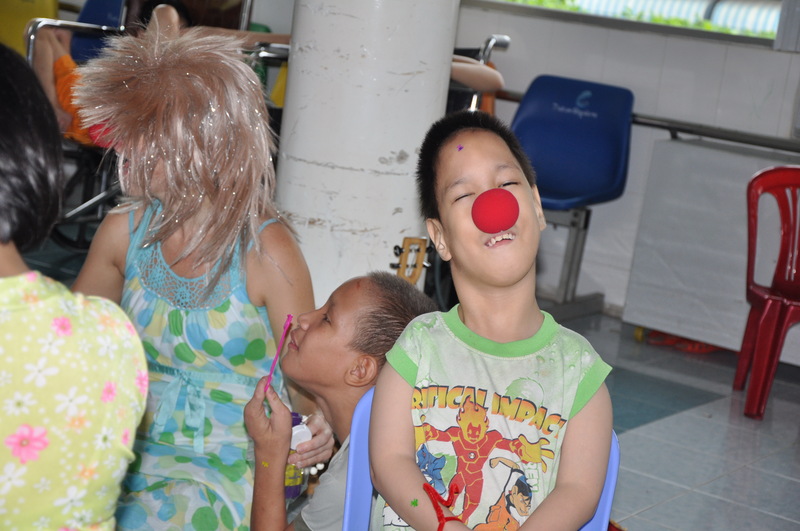 I am requesting donations for aid in my transportation, food and lodging, as I continue two more weeks of volunteer clowning and music therapy in hospitals, orphanges and shelters for handicapped in Ho Chi Minh, Vietnam. More Later. Blessings.